In honor of Memorial Day, when we remember the men and women who died serving our nation, here are six forts along the Pacific Coast that we think everyone should visit at some point. At these forts, you can explore the outdoors while getting a first-hand experience of U.S. history. Memorial Day is the perfect time to visit any of them. And since the forecast for much of the western side of Oregon and Washington sounds spring-like, a trip to the coast is always enjoyable, rain or shine. 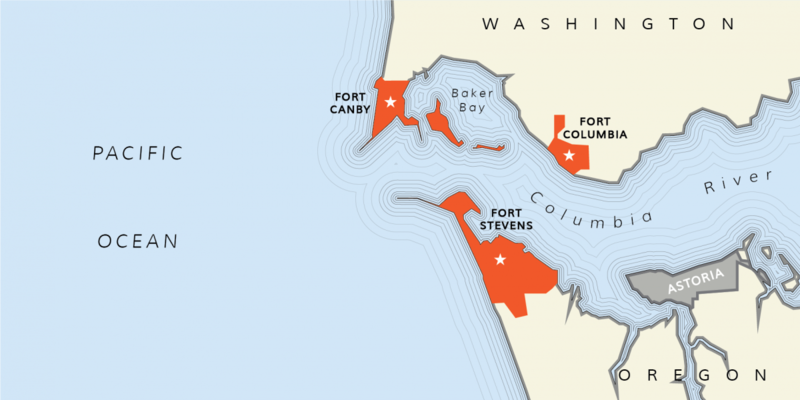 Three of the forts are in close proximity to one another at the mouth of the Columbia River. Together they made up the Columbia River Harbor Defense System. Fort Stevens is on the Oregon side, and you'll get to explore the fort and the historic Peter Iredale shipwreck located along its beach. The state park also hosts Oregon's largest campground. What was once called Fort Canby is now Cape Disappointment State Park. The area hosts two lighthouses, a number of hiking trails and paved bike paths, and another large campground. Further inland on the Washington side of the river is Fort Columbia. Here you can explore nearly 600 acres of the fort that was used through World War II, and you can hike the many trails that lead up Scarborough Hill. A few miles south of Fort Stevens is Fort Clatsop and the Lewis and Clark National Historic Park. Fort Clatsop marks the end point of Lewis and Clark's journey to the Pacific Ocean. Here they constructed a two-building fortress and camp (in just three weeks) to overwinter before starting their return journey east. The fort replica that stands today was reconstructed after being damaged by a fire in 2005. Heading way south to the San Francisco Bay Area, two more forts offer a great opportunity to explore history and the outdoors at the same time. Sitting beneath the Golden Gate Bridge is Fort Point. The fort was built as a Civil War era fortification. It never saw combat, but its brick and granite walls, at 5 to 7 feet thick, were built for heavy artillery. The fort is open to the public and also has a great exhibit about the construction of the Golden Gate Bridge, which looms above the open courtyard. A short drive south along the San Francisco Peninsula will get you to Fort Funsten. The area has numerous trails that are used for hiking and horseback riding. A trail leads to Battery Davis, a series of bunkers that remain from when the fort was a World War II military installation.